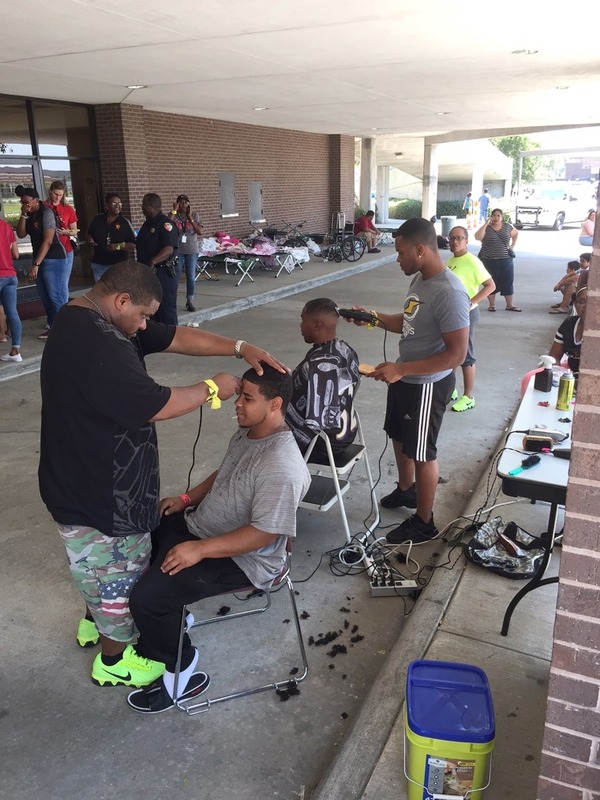 Harvey survivors receive grooming care at The M.O. Campbell Center in north Houston. As Hurricane Harvey relief donations pour in from around the world and celebrities from Kevin Hart to Tyler Perry urge contributions, many are looking to Houston area mega-churches and asking whether the role of the church during times of disaster should extend beyond spiritual sanctuary. Despite some pointing fingers -- who should do what and how far should that spiritual assistance should go -- leaders in the faith community say they’ve spent this week assessing the needs of their flock and are mobilizing to provide aid. Gospel singer and YouTuber Joseph Solomon has teamed up with members of the Poets In Autumn Tour, a group of poets spreading the gospel through spoken word, to gather donations that will go directly to 8-10 families in need. Singers David and Tamela Mann, known for their roles in Tyler Perry shows like “Meet The Browns” are asking people to make donations to The Mint Foundation. The National Baptist Convention is asking people to make contributions to their disaster relief fund. Pastor Creflo Dollar of World Changers Church International is asking people to make monetary donations online and send items to his Houston church. “In the midst of this catastrophe, our city needs a lot of helping hands,” James Edwards, pastor of Transforming Faith Christian Center said in an Instagram post. His church in southwest Houston will open Saturday as a distribution center to help communities such as Meyerland, Sharpstown, and Braeswood. He compiled a “wish list” of items people in the communities need and is accepting online donations. Jamail Johnson, pastor of The Word Church in north Houston and a native Houstonian, called the flood “one of the most disheartening things I’ve ever seen in my life” but he said he was blessed. Parts of his neighborhood had severe flooding but his home was spared. Although his church was flooded with nearly 2-feet of water, his team has been been distributing items and resources from the M.O. Campbell Center, a multi-purpose facility in north Houston that has been designated as a shelter. Mega-church pastor Joel Osteen was blasted on social media for delaying to open up his nearly 16,000-seat Lakewood Church as a shelter. In an interview with The Today Show, Osteen said the doors of his church were never closed but he waited to open the doors for safety concerns. Osteen’s church is now serving as a distribution center and a shelter, housing evacuees and providing food, clothes, and medical needs. Through his missions ministry, Osteen has provided disaster relief efforts to Houston in the past. When record rainfall brought flooding to the city in 2016, Osteen’s church partnered with organizations to help those affected, cleaning debris from their homes and distributing needed items. His team has also helped global relief efforts for countries damaged by hurricanes such as Haiti and Belize. Johnson said he understands why Osteen hesitated to offer his church up as a shelter and that when people are in their emotions they don’t stop and consider a pastor may be in same situation as them. For the ones who were quick to throw stones at Osteen, Johnson said they need to take a look at themselves. After social media heaped coals of fire on Osteen, other prominent mega-pastors were put on blast. Bishop T.D. Jakes, senior pastor of The Potter’s House, a church with several locations in Texas with the main campus over 200 miles away in Dallas, said the church and his humanitarian organization MegaCARE are working with the city of Dallas and nonprofit organizations on getting resources to Harvey victims. People also took to social media to lash out at Bishop I.V. Hilliard of New Light Church, posting memes of him standing next to a helicopter — a reference to when the prominent pastor came under fire in 2013 for reportedly asking members to sow a seed of $52 to upgrade helicopter blades. Dr. Irishea Hilliard, senior pastor designate of New Light Church, and daughter of Bishop I.V. Hilliard and Pastor Bridget Hilliard said their track record for helping people in times of need speaks for itself. Because of flooded roadways, Dr. Hilliard said Wednesday was the first day she was able to drive around and assess their four Houston-area locations. Each one will open as a distribution center on Friday. She added that they have been communicating with city officials on providing resources, they are receiving donations and items from a coalition of pastors and they have offered up their facilities as a shelter to the Red Cross. She said they have also been in contact with their members and are allocating resources for the ones impacted by Harvey. As faith leaders try to figure out the best ways to help Harvey victims, some people are questioning whether or not their acts of kindness will be used the right way. In a Facebook live post, Tyler Perry told fans he was vetting organizations and donating to people with “boots on the ground.” He also said he would donate $250,000 to both Lakewood Church and Beyonce’s pastor Rev. Rudy Rasmus, as well as another $500,000 to other undecided charity organizations. “Make sure you're donating money to the people who are going to give it to the people that need it,” Perry said. With the American Red Cross under fire over the uncertainty of how donated funds for Harvey relief will be used, Johnson said local organizations can get resources to people faster. Although the rain has stopped and flood waters are starting to recede, the communities have a long road of recovery ahead of them. Hilliard said despite what’s happened, the city will rebound and be stronger than before. She wants people to know that a better day is coming.